"All I can say is WOW and thank you to Laura from Change of Latitude Travel. I had no idea where to go and she had wonderful suggestions for me being very attentive to what I wanted. My vacation was superb with all of the tips from her. The resort itself was exceptionally beautiful and the entertainment every night was fantastic. Laura told me that if I took lessons on the paddle boards and the catamaran the very first day that I was there that I could use them whenever I wanted (as long as they were available) the whole time that I was there. She also told me that around lunch time there would be carts around the resort that would have something special everyday so that if you wanted to hang by the pool or by the beach and not get out of your bathing suit, you could try Jamaican Heritage food. Thank you for the Great advise. I really enjoyed the jerk chicken (with no extra spices) and the coconut juice (milk). I know from now on I am not going to try to use the internet and go strictly to her for all of my travel wants and needs! " "I was greatly pleased with Laura's quality of service. She listened to our requests and requirements and recommended great destination wedding resorts for us to choose from. She organized all the travel and lodging in Mexico for 35 of our guests. Laura was very flexible with individual guest requests, and got a great rates for my guests. She played the liaison between myself and the wedding coordinator at the resort. This lead to a quite effortless, seamless process. I was also very impressed with how she continued to support my guests through their travel to, and during their stay in Mexico. I would highly recommend working with Laura she is very professional and personable. She made the entire experience very easy, which is key when planning a destination wedding!" "Laura was a delight to work with. I 100% recommend her! Everything went smooth and all involved were very pleased with Laura and the services she provided. We will definitely use her again in the future." "A Change of Latitude took care of our every need for our destination wedding and honeymoon. We took our time interviewing travel agents and after meeting Laura we knew we found the perfect person to help us...she help us choose the destination (Jamaica), the resort (Sandals White House), and connected us with an awesome wedding planner, after all of that, she made sure we and all of our guests got VIP treatment during our weeks stay. I would recommend A Change of Latitude HIGHLY if you want personalized service and treatment from the beginning to end." "I worked with Laura from A Change of Latitude to plan my destination wedding Riviera Maya, Mexico. The resort she helped us choose was Excellence, and it was AMAZING! Laura is very knowledgeable and will do what ever it takes to make sure you are happy. She made the entire process stress free. All of our guests found her to be very helpful as well. I would definitely recommend using A Change of Latitude for any of your travel needs! We plan on taking a separate honeymoon in November to Hawaii, and we'll be using A Change of Latitude for that trip too!" 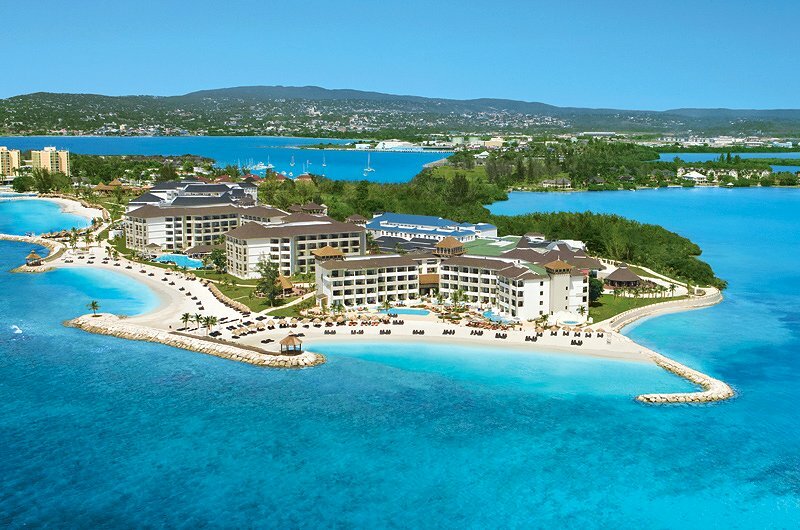 In Secrets Wild Orchid Montego Bay, you'll discover a destination where Unlimited-Luxury® is all about the good life. At the heart of every Secrets getaway is Unlimited-Luxury®. From the instant you check in, these elite privileges touch every aspect of your Secrets stay, all the while, without the wristband identification most vacation destinations require. Quite simply, 24 hours a day, you'll have entrée to savory cuisine, leisure adventures, and entertainment; not to mention incomparable lodging and a high level of special, personalized attention. 2011 TripAdvisor Certificate of Excellence - Secrets Wild Orchid Montego Bay has earned the 2011 Certificate of Excellence from TripAdvisor. This prestigious recognition awards properties who consistently receive excellent ratings from the many members of the TripAdvisor community. 2011 AAA Four Diamond - Secrets Wild Orchid has earned their first AAA Four Diamond Award. To earn the highly-prestigious AAA Diamond rating, resorts must meet high standards in service, accommodations, cuisine and amenities. 2010 Travel Weekly Reader's Choice Award: Best Resort Chain - Secrets Resorts & Spas awarded Best Resort Chain in Mexico by the 2010 Travel Weekly Reader's Choice Awards. These awards are based on the votes of thousands of Travel Weekly readers who have the knowledge and expertise to select the resorts with the highest levels of quality, service and accommodations. 2010 Flight Centre USA Award - Best New Resort - Secrets Wild Orchid Montego Bay was honored with the Best New Resort Award by Flight Centre USA. This award recognizes the quality service, outstanding product and elite accommodations that Secrets Wild Orchid has been able to provide guests since their recent opening. Pros: A short 30 minute or less ride from MBJ Airport. All inclusive resort. All rooms are Jr Suite Ocean View & above. Resort also includes sister resort, Secrets St James. No reservations needed at restaurants. 24 Hour Room Service. Daily Activities. Nightly Entertainment. Great Jerk Chicken Cart. Great Service. .
Cons: A two hour drive to Ocho Rios & the infamous Dunns River Falls. A 90 minute ride to the infamous Rick's Cafe in Negril.